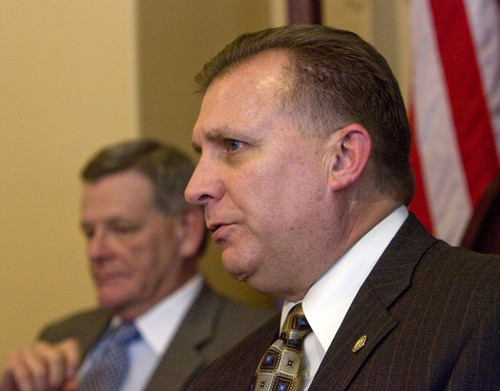 | Tribune file photo Sen. Curt Bramble, R-Provo, is sponsoring legislation that would further delay implimentation of immigration laws passed three years ago. Sen. Curt Bramble signaled Monday that two bills at the heart of rancorous immigration debates three years ago  but had their effective dates delayed for years  may be repealed outright soon if the federal government does not provide waivers to operate them. One of those laws would create a state program to allow undocumented immigrants now in Utah to obtain a guest-worker permit  and stay in the state  by paying a fine, submitting to a background check and showing proficiency in English. The other is a temporary pilot program that would allow any U.S. citizen who is a Utah resident to sponsor an undocumented immigrant not already in the state to live and work here  but those immigrants could not leave Utah. Bramble, R-Provo, is sponsoring SB203 to delay the implementation dates of those laws until 2017 instead of the currently scheduled 2015. The Senate Business and Labor Committee passed it Monday 4-0 and sent it to the full Senate. Bramble noted the earlier-passed laws likely need waivers in federal law to work, which he said are unlikely to come. So, he said, "If we don&apos;t get a waiver, I&apos;m going to recommend, before that  date, that those bills be repealed." He explained, "The purpose of the whole immigration debate [three years ago] was to send a message to Congress that it is possible to find a rational, reasonable solution." He said that was accomplished ­ and showed what a state-only program could look like if a federal waiver were granted. He said it is worth seeing whether current talk about immigration reform in Congress could bring reform soon, and, if not, to repeal the laws before 2017. Jean Hill, representing the Catholic Diocese of Salt Lake City, testified in support of both the extension of the effective dates and possibly repealing the laws. She said it is confusing to many to have those laws on the books but not yet in effect  and it confuses them about what is legally possible.